The festival of Purim will take place on Wednesday, March 20th at 7:00 PM. 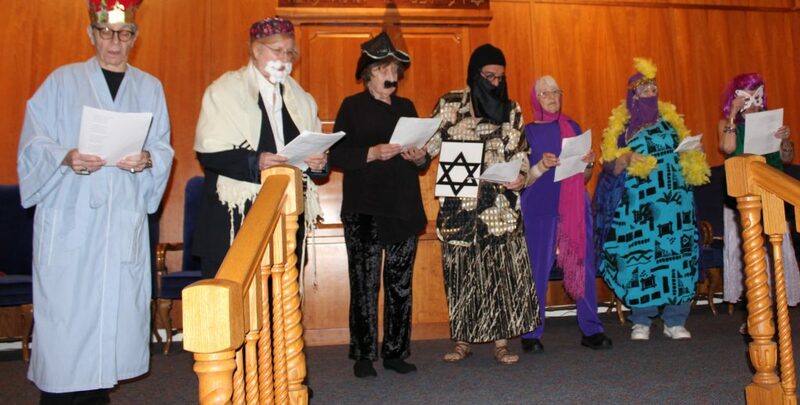 Last year congregants joined in the fun and the interactive Purim Spiel, listened to the Megilla reading, made some noise, and enjoyed some wine (kosher for Passover), cheese and Hamentashen. The Persian empire of the 4th century BCE extended over 127 lands, and all the Jews were its subjects. When King Ahasuerus had his wife, Queen Vashti, executed for failing to follow hisorders, he orchestrated a beauty pageant to find a new queen. A Jewish girl, Esther, found favor in his eyes and became the new queen—though she refused to divulge the identity of her nationality. Meanwhile, the anti-Semitic Haman was appointed prime minister of the empire. Mordechai, the leader of the Jews (and Esther’s cousin), defied the king’s orders and refused to bow to Haman. Haman was incensed and convinced the king to issue a decree ordering the extermination of all the Jews on the 13th of Adar—a date chosen by a lottery Haman made. Mordechai galvanized all the Jews, convincing them to repent, fast and pray to G‑d. Meanwhile, Esther asked the king and Haman to join her for a feast. At the feast, Esther revealed to the king her Jewish identity. Haman was hanged, Mordechai was appointed prime minister in his stead, and a new decree was issued—granting the Jews the right to defend themselves against their enemies. On the 13th of Adar the Jews mobilized and killed many of their enemies. On the 14th of Adar they rested and celebrated. To relive the miraculous events of Purim, listen to the reading of the Megillah (the Scroll of Esther) twice: once on Purim eve, Wednesday eve March 4th and again on Purim day, Thursday, March 5th. To properly fulfill the mitzvah, it is crucial to hear every single word of the Megillah. At certain points in the reading where Haman’s name is mentioned, it is customary to twirl graggers (Purim noisemakers) and stamp one’s feet to “eradicate” his evil name. Tell the children that Purim is the only time when it’s a mitzvah to make noise! Concern for the needy is a year-round responsibility; but on Purim it is a special mitzvah to remember the poor. Give charity to at least two (but preferably more) needy individuals on Purim , Wednesday evening, March 23rd. We will have a charity box located in the lobby of the Temple for you to perform this Mitzvah. The mitzvah is best fulfilled by giving directly to the needy. If, however, you cannot find poor people, place at least three coins into a charity box. (See Below) As with the other mitzvahs of Purim, even small children should be taught to fulfill this mitzvah. On Purim we include the Al HaNissim prayer, which describes the Purim miracle, in the evening, morning and afternoon prayers, as well as in the Grace After Meals. In the morning service there is special reading from the Torah scroll in the synagogue (Exodus 17:8–16). It is a tradition to give three coins in “half” denominations—e.g., three half-dollar coins—to charity, to commemorate the half-shekel that each Jew contributed as his share in the communal offerings in the time of the Holy Temple. This custom, usually performed in the synagogue, is done on the afternoon of the “Fast of Esther,” or before the reading of the Megillah. We will be collecting your donations on Wednesday evening, March 4th.